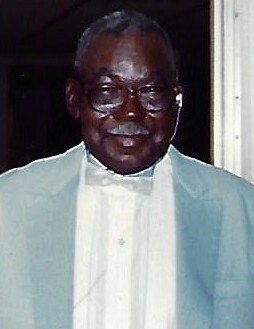 Mr. Isaac Mack, Sr. was born February 8, 1917, to the late Bro. James and Hattie Mack. At an early age he joined Wesley Chapel Episcopal Methodist Church in Ocala, Cotton Plant, FL. December 24, 1938, Bro. Isaac was joined in Holy Matrimony to Sis. Willie Mae Maultsby. To this union ten children were born, eight boys and two girls. July 11, 1992, his wife of 53 ½ years transitioned to her eternal dwelling. Also, four sons, Curtis, Jerome, Ivory and Leroy preceded him in death. Those who will cherish his memories are: two daughters, Earline Burnette and Ethel McQueen of Ocala, FL; four sons, Norris (Mary) Mack of Long Branch, NJ; Isaiah Eugene Mack and Ronald Mack (devoted caretakers) and James Mack all of Ocala; two daughter in laws – Lena Mack and Joan Mack of Ocala; one brother, Edmon Mack of Williston, FL; a special nephew, Joseph Mayweather of Ocala, a devoted grandson Fred Chisholm, 20 grandchildren, 43 great grandchildren and 16 great great grandchildren, a host of nieces, nephews, cousins and friends. Public Viewing will be on Friday, March 23, 2018 from 12 noon until 6:00pm at Summers Funeral Home, 2238 NW 10th St, Ocala, Florida. Funeral Service will be on Saturday, March 24, 2018 at 11:00 AM at Wesley Chapel United Methodist Church, 12264 West Highway 40, Ocala, Cotton Plant, FL 34481, Rev. Miquell Mack, Pastor. Rev. Stanley Jacobs, Eulogist. Interment will follow in Wesley Chapel United Methodist Cemetery.